Conservative leader David Cameron has been on the beat with police officers in Hull to witness the problems of alcohol-related crime. Mr Cameron said he was exploring how "to deal with the drink that's fuelling so much of the crime in our country". He had been invited to the city by two officers whom he had met at this year's National Police Bravery Awards. Pc Alan Cowley and Pc Gareth Walker got an award for rescuing three drunken men at Hull Marina in April 2008. The Pcs jumped into the marina to rescue the men, who were drunk and had got into difficulties in the water. Mr Cameron made a visit to the marina to hear about the rescue, which he described as "fantastic", carried out by "very brave" officers. The Tory leader then joined police on patrol in the city. 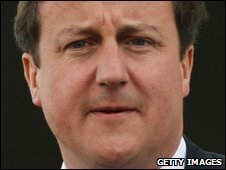 "Drink-related violence and drink-related crime are a massive problem in our country," Mr Cameron said. His party planned "serious changes" to the Licensing Act to help tackle the problem, he said. "We need to look at the unbelievable availability of very cheap drink, getting three litres of cider for £1.99, at all hours of day and night. "We've got to do something about this and I'm exploring what we can do to deal with the drink that's fuelling so much of the crime in our country."